The Saturday, September 9 Wagman Moonrise Star Party starting about 7:40 PM EDT creates an opportunity to view the Moon and the September Sky. Observe the Moon along with the Hercules Cluster, the Ring Nebula and the Andromeda Galaxy and much more. Uranus and Neptune will be available for observing later in the evening. See a region of space where stars are being born, catch a dazzling view of Jupiter and see Saturn’s rings in the evening sky. Marvel at our Milky Way Galaxy’s finest planetary nebulae, star clusters. See the Hercules Cluster, the Ring Nebula and the Andromeda Galaxy. 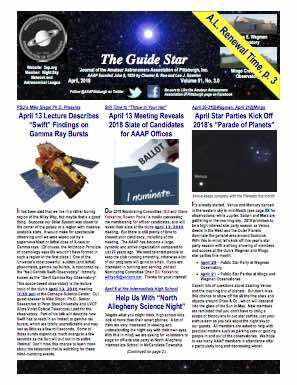 Amateur Astronomers Association of Pittsburgh at the AAAP’s Wagman Observatory August 25 and 26 Star Parties. These August 25 & 26, 2017 Wagman Star Parties create an opportunity to view the July sky: Jupiter and several of its moons, followed by Saturn, its rings and some of its moons, the dazzling Hercules Cluster, the Ring Nebula and much more.